At the dawn of the 20th century, a time of great prosperity and industrial advancement known as the Gilded Age, sea travel began a transformation that would take it from an undesirable yet necessary mode of transportation to that of a luxurious and much sought after experience. At the forefront of such nautical achievement the Cunard Lines and White Star Lines sought to create the largest and most grandiose vessels the world had ever seen. Beginning in 1909 the RMS Titanic would soon come to be known as the finest ship at sea, bedecked in true finery and style and dubbed unsinkable, and soon after that would become the focus of the most well known shipwreck in history. Though short lived, this fabulous ship emerged as the largest passenger steamship in the world, carrying the wealthy, elite, and famous across the Atlantic, as well as standing as a symbol of hope for the many European passengers looking to begin life anew when they reached the United States. Both a legend and a tragedy, a shining example of man\'s ingenuity as well as a warning against unchecked pride, the RMS Titanic will live on forever in the annals of history. Designed to compete with Cunard\'s massive ocean liners the Lusitania and the Mauretania, White Star Lines sought to create a ship of such stature that she would forever be known as the grandest ship at sea. Funded by J.P. Morgan for an estimated $7.5 million, the approximate equivalent of $170 million today, design and construction of the ship begin in earnest during the first decade of the 1900s. Renowned ship builder Thomas Andrews Jr., of Harland and Wolff Shipyards and the Institute of Naval Architects, began drafting the plans for the Titanic and her sister ship Olympic in 1907. With the aid of shipbuilder William Pirrie and general manager Alexander Carlisle, the plans for the Titanic were complete and her hull readied to be laid down for construction just two years later. By September of 1908 the plans had been approved and the ship formally ordered, and on March 31, 1909 her hull was finally laid and her destiny in sight. Launched on May 31, 1911, and completed on March 31, 1912, the RMS Titanic emerged as the world\'s largest passenger steamship, a true nautical gem for all who beheld her. 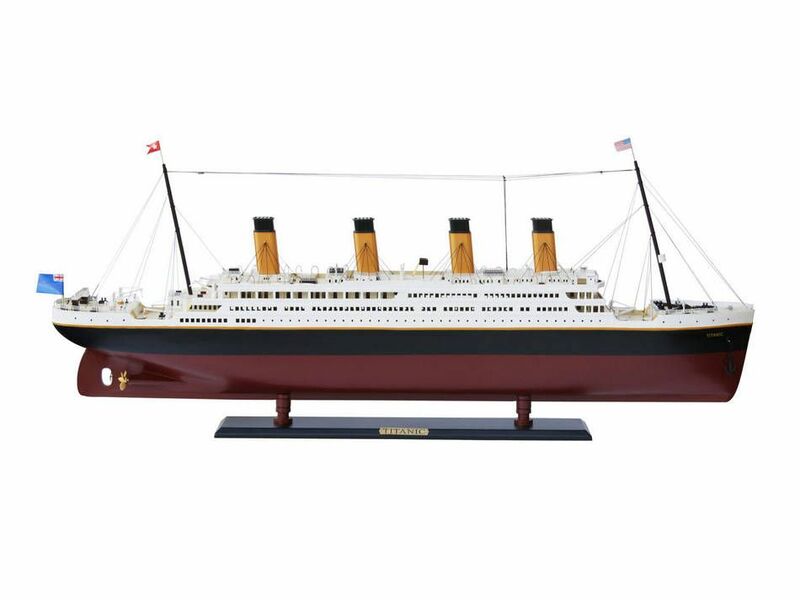 At 882 feet long, with a beam of 92 feet and a height of 175 feet, the Titanic loomed over neighboring ships, her double plated steel hull gleaming with promise and excitement. Living up to her mythical name, engineers and designers had to redesign the docks to accommodate her vast hull before interior work could begin on the Olympic-class Royal Mail Ship. Docked at Belfast, Ireland\'s Harland and Wolff Shipyads, the 50,000 ton Titanic was a marvel of engineering for the time. 29 boilers, with a total of 159 coal furnaces, powered the massive 15,000 Hp reciprocating engines, while two triple-blade propellers and one quadruple-blade center propeller were crafted from gleaming bronze. With a designed 46,000 Hp, and a maximum of 59,000 Hp, the ship could reach speeds of up to 23 knots (26 mph). Fitted with three towering 62-foot funnels, these massive engines made the Titanic the largest moveable man-made object in the world. While a fourth funnel was added to the ship, it was purely for show, as it was non-functional. As with any design and construction project, once the groundwork had been laid it was time to appoint the Titanic with the luxurious amenities and accoutrements that would elevate her to her legendary status. Nine decks, lettered A through G, would become some of the finest ship staterooms ever created, and indeed finer still than many of the world\'s contemporary luxury hotels. First class was dominated by a shimmering 6-story, glass-domed central staircase, lit by chandelier and radiating the elegant atmosphere of the vessel (made famous as a primary set in the Hollywood blockbuster Titanic). Leading from this staircase, first class passengers could enter the fabulous dining saloon or continue on to the Palm Court or the Verandah Restaurant. The famous Café Parisien was also a favorite with guests, where for the first time passengers could enjoy sea views through the restaurant\'s large picture windows, or even dine al fresco; standard on today\'s grand ships, this feature was an exciting innovation at the time. First class passengers were also privy to the Titanic\'s fully operational telephone system, a stylish barber shop, and a library, while further innovations would become industry standards in the century after her creation. Adding to the already opulent accommodations, the first class section also offered guests a pool, squash court, Turkish bath, electric baths, two music ensembles (instead of the usual one), and a gym complete with mechanical horse and camel for the era\'s premier riders. Along with such fine trappings throughout her decks the Titanic also boasted elegant staterooms, spacious and comfortable, crafted from rich woods and ornate paneling and bedecked with the finest furniture. Such finery was not cheap, however, as the most expensive one-way tickets cost approximately $1,300, equivalent to nearly $65,000 today. While the first class was incomparably elegant, third class passengers were still greeted with their own remarkable staterooms. While these were not fancy or opulent in any way, they did boast indoor toilets, which at the time were not even a standard feature in the average home. The grand ship also incorporated the technologically advanced Marconi Wireless Telegraph, a piece of equipment that would play an intriguing roll in the Titanic\'s eventual sinking. With her construction complete, the Titanic was paced through her sea trials on April 2, 1912, just under a week before her doomed departure. Beginning at 6 am the massive ship was fired up by 78 engine workers and a crew of 41, including the Board of Trade\'s representative Francis Carruthers, who signed off on the Agreement and Account of Voyages and Crew making the Titanic a legally sea-worthy vessel for a 12 month term. Following her successful sea trials, the Titanic departed from the Harland and Wolff Shipyards en route to Southampton, England for her maiden voyage. Captained by 62-year-old Edward J. Smith, a White Star Lines employee of 38 years, 25 of which in captaincy, the Titanic was set to depart Southampton on April 10, 1912, the first and final voyage of a ship that was tragically deemed "unsinkable." Setting sail to great fanfare and celebration, the fabulous RMS Titanic was truly the grandest vessel ever created, carrying nearly 2,000 people as it made its fateful voyage. As befit such a magnificent vessel many of the world\'s most prominent and wealthy citizens boarded her in what they believed would be the greatest cruise the world had ever witnessed. Included on the docket were the likes of billionaire John Jacob Astor IV and his wife Madeleine Force Astor, industrialist Benjamin Guggenheim, Macy\'s owner Isidor Straus, and the soon to be legendary Margaret "Molly" Brown. While ship investor and banking magnate J.P. Morgan was scheduled to depart on the Titanic, his trip was fortuitously cancelled at the last minute. Sailing from Southampton the Titanic made port in Cherbourg, France, to accommodate additional passengers then made one final stop in Queenstown, Ireland before venturing out into the Atlantic. For four magnificent days the RMS Titanic cruised across the Atlantic, her 2,223 passengers enjoying unheard of luxuries and accommodations. From dips in the pool, to wonderful music, dances, and the finest cuisine served in 10-course meals, life aboard the Titanic was truly magical before her untimely demise. On the night of April 14th the joy and exuberance of life aboard the Titanic would forever be erased, as the grand ship would make headlines for the last time in her career, sinking beneath the icy waters just off the coast of Nova Scotia. Less than a day before the accident Captain Smith had put the Titanic on a more southerly course, attempting to steer clear of the dangerous waters North after being advised by other ships via radio. That Sunday evening, while passengers were enjoying the joyous ambiance, flowing live music, and enviable cuisine, the Titanic continued her deadly course through the dark waters. With no moon on April 14, in completely placid, glassy waters, icebergs became difficult to detect, with no waves to crash against their sides and no moonlight to illuminate them. Unfortunately for lookouts Frederick Fleet and Reginald Lee, the ship\'s binoculars had also been misplaced, thought to have been left on shore in Southampton. Throughout that fateful day, the Marconi Wireless system had been quite active as radio operators Jack Phillips and Harold Bride transmitted messages from the ship to passengers\' relatives on land. Hired by Marconi, not employed by White Star Lines, the two operators were tasked with personal communications messages instead of messages to the bridge; an oversight that very well could have altered the course of history for the Titanic. As of 1:45 pm that afternoon, the operators had received communications from the nearby steamer Amerika, warning the Titanic of icebergs in her path. Continuing throughout the remainder of the day, five additional iceberg warnings were received, though none reached the bridge. With important safety messages being placed on a "non-essential" list, the radio operators continued their work as the ship continued her voyage. Within less than 10 hours, Titanic would be sinking. At approximately 11:40 pm, on the night of April 14, 1912, Titanic\'s lookouts spotted what they believed to be a massive iceberg off the ship\'s starboard side. Sounding the warning bell three times, lookout Frederick Fleet telephoned the bridge, prompting the 1st Officer to give the order for emergency evasive action. Though Helmsman Robert Hichens turned the ship hard starboard, the Titanic was unable to avoid collision. With a relatively small rudder, compared with the massive Cunard Ships, the Titanic operated extremely efficiently while cruising but suffered from impaired mobility when attempting to change course. This, combined with human error and mechanical deficiencies, lead to the grand ship ending her career on the bottom of the Atlantic. Just 37 seconds after the warning was sounded, the iceberg collided with the ship on her starboard side, buckling sections of the steel hull and causing her to take on water. It was later discovered that, though the Titanic\'s hull was 1.5 inch double-layered steel, the composition of the hull plates became brittle in icy water, while additionally the rivets used in the stern and bow of the ship were poorly installed by hand rather than machine. Within the first 10 minutes after the collision, five of the ship\'s 16 "water-tight" compartments were filled to a depth of approximately 15 feet. While the ship was capable of staying afloat with any of the two center compartments flooded, or up to four of the forward compartments flooded, once the cold Atlantic water began to overflow the tops of the 6th and 7th compartments the reality of the Titanic sinking was fully appreciated. Just 20 minutes after the impact the forward 3rd-Class spaces began to flood, and within half an hour the first of the lifeboats were being loaded and lowered into the water. During this time radio operators Phillips and Bride were sending CQD distress signals as well as the newly created SOS signals, which were received by numerous ships nearby. Though within distance, many of the ships were far too slow to arrive in time for any assistance, the Carpathia the only one that came to the Titanic\'s aid. A mere 58 miles away, the Carpathia steamed towards the ailing Titanic, though her arrival four hours later would be too late to save the majority of passengers and crew. It was also at this time that the Titanic\'s most glaring and egregious error came to light: her woefully inadequate lifeboats. With 2,223 passengers and crew aboard, the Titanic only carried 20 lifeboats with a maximum capacity of 1,178; far lower than necessary, yet above the legal standards for ships of the time. In the ensuing panic following the collision, many of these lifeboats were launched prematurely, with only a few people aboard or without proper protocol, causing some to capsize and others to simply float away from the dying vessel. Placed bow to stern on both the port and starboard sides of the ship, the remaining lifeboats were filled primarily with first class passengers, and women and children per Captain Smith\'s order. Within two hours, the ship\'s bow was completely submerged and all but two of the lifeboats had been launched, though many like lifeboat #7 had only 28 people out of a 65 person capacity. Compounding the already horrific accident, this lack of safety equipment contributed to the deaths of more than 1,500. In the final moments of the ship\'s brief existence the stern began to ascend from the water, bringing the massive bronze propellers high into the sky. As all unsecured equipment, and people, began the lengthy fall to the water the ship, bearing its own weight began to crack in half. With the physical stress of the ship\'s raised stern, power finally went out and the ship sank beneath the Atlantic completely. Within a few hours of the Titanic\'s sinking the Carpathia arrived to rescue the stranded survivors from the 28 degree water. Of the more than 2,000 people aboard the ship, only 711 survived, making the Titanic tragedy the worst peace-time maritime disaster in history. Three days after that awful ordeal, on April 18, 1912, the Carpathia steamed into New York\'s Pier 54 much to the relief of the survivors and their families. While the sinking of the ship was an international tragedy, it did lead to vastly improved safety conditions aboard any vessel, measures that have saved countless lives in the century since her horrible disaster in the Atlantic. While the Titanic may have been silenced forever, her legacy endured and positive change was enacted. This aside, the ship herself, her captain and crew, and the myriad passengers who sailed on that fateful voyage, all became intertwined in the legend of the grand RMS Titanic. On September 1st, 1985, the long sought after wreck of the Titanic was discovered by a joint American and French expedition. Located just further than 370 miles off of Newfoundland\'s Mistaken Point, at a depth of 2.5 miles, the legendary ship had been rediscovered and a new intrigue and excitement over her history was ignited. 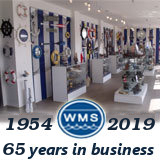 Historical facts were settled (such as the debate as to whether or not she had broken in half), testing was done on retrieved pieces of the ship, and artifacts and wreckage material were brought up for display at the National Maritime Musuem in Greenwich, England. Though she met her end at the bottom of the Atlantic, the grandest ship to ever sail the seas - the luxurious and magnificent RMS Titanic - truly left her mark on history. A glowing testament to mankind\'s ingenuity and ability, a stark reminder of overconfidence and shortsighted pride, a fabulous history and exciting mystery, and a tragedy to be remembered forever. For all she was, and all she continues to be, the RMS Titanic stands alone amongst vessels of the sea, eternally the fabulous ship she once was on her celebrated voyage in 1912.